It has been hard to find inspiration to write, but as the spring gets closer to summer I find myself in amazing events, meeting interesting people full of good vibes and the inspiration slowly creeps in. Like today, as I sit at outside one of my favorite cafes in Alameda drinking matcha and enjoying the warmth of the sun. I haven’t done my Kat’s Meows of the Week for a loooong while so here it is! See my previous ones here. Let me introduce to you my current favorite things to drink/eat/wear/do/listen/read. I keep a stainless steel bottle on my desk at work to make sure I drink enough water. I fill it at least twice a day with just plain water and in the mornings I drink mostly herbal teas from it. I like adding a drop or two of lemon essential oil as well as a drop of DoTerra’s DigestZen which aids with digestion (and tastes yummy too). I’ve been looking and looking for organic cotton/hemp/bamboo yoga clothing with funky designs but have found none, so I just bought my last non-organic leggings the other day. They have cute palm leaf design so they’re perfect for my first ever Bay to Breakers run that I got to do VIP style this year. I was going to add some palm leaves on my head as well but couldn’t find any. This years theme for the run was “Originality” and the headline sponsor of the race is Orig3n who were kind enough to invite me to experience it. Studies have shown that chlorella benefits the entire body by supporting healthy hormonal function, promoting cardiovascular health, helping to negate the effects of chemotherapy and radiation, lowering blood pressure and cholesterol, and aiding in the detoxification of our bodies. I add mine to my morning lemon water together with MCT oil. Just be mindful with sourcing. Here’s a good one. This is one delicious hybrid food. I’ve tried them all (I think), but this one takes the gold. Sushirrito’s only veg option is called Buddha Belly (Spicy Japanese Eggplant, Portobello Mushroom Fries, Shaved Cabbage, Julienne Carrots, Ginger Guac, Kale Roasted Garlic Tofu Sauce) and it’s just the perfect combination of all these different textures and flavors. Extra points: it’s big enough to save the other half for dinner! Since my other organic bronzer has been discontinued I’ve turned to W3ll People who’s concealer I’ve been loving for years now. I’m pretty much 100% organic with my skin care at this point (it’s been a slow process over the years) and do my research on anything I choose to purchase making sure it is not harming me, other people, animals or the environment. 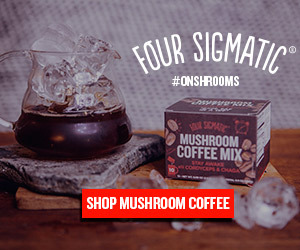 My favorite fun guys from Finland have created more amazing products to their Four Sigmatic superfood company’s selection. Now there’s matcha with mushrooms (my fave! ), mocha, golden milk and chai. Perfect for my not-a-fan-of-taste-of-coffee taste buds. And I get the benefits of the added herbs, medicinal mushrooms and other adaptogens in them! Win-win! Curious to try? Use code KATARIINA10 for 10% off your purchase here. Yes, I got a new pillow for myself! Pillows don’t usually sound exciting, but trust me, this one is. And no, it’s not made of avocados. It is though organic, non-toxic, sustainable, hypo-allergenic pillow that’s made with natural eco-INSTITUT certified latex rubber foam ribbons and natural kapok fiber, generously stuffed inside a luxurious, high-thread count cover made with GOTS-certified organic cotton. Now does that sound good or not? Buy it here. I’ve been to sound healings a couple of times before, once combined with acupuncture and the second time combined with essential oils. This time I brought my own oils and the sound master was Danny Goldberg who’s resume is impressive! He has been doing these sound healing meditations in hospitals and for cancer patients, Stanford University and so on.